The VOTE SUMP! Public art project is progressing nicely. The micro web site is coming together. As is the game. The cafepress shop is ready to sell SUMP! Merchandise Although that's not the intent of the project. I finally got one full size SUMP! 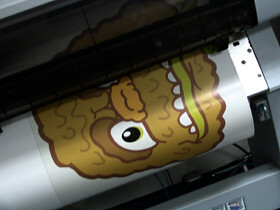 printed and cut out. So far this has been the most difficult part of the project. It takes an hour to print and about two hours to tape down and cut out of cardboard. I have one more to do. Since the plan is to attach one SUMP to each of the two "welcome to Vicksburg" signs I'm hoping they won't be taken down or stolen the evening I put them up. Much of the project relies on people seeing the large Sump(s). I've safeguarded myself somewhat from this happening because I'll put a note on the back of each one explaining it's part of a public art project and will be removed shortly. Hopefully that will keep the city workers at bay... not necessarilly any theives. Also along the line of safeguarding the project I bought some SUMP merchandise (t-shirt, boxer shorts and a mug)and will be placing them at the doorstep of the Village Manager's office a couple days before the "big roll-out". I'm also placing what looks like a ransom note telling him to sit back and enjoy this next public art project. 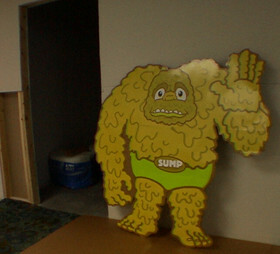 I feel if he has a little advanced knowledge about the project he won't freak out when SUMP signs are all over town. This coming week will involve printing a lot of signs, window flyers and another large SUMP. Hopefully the roll-out will be within the next 2 weeks. Time will tell.